Blythe Masters, CEO of Digital Asset Holdings, discussed the potential business impact of blockchain technology at an event sponsored by Women in Fintech and the Financial Women’s Association in New York this week. Hosted by PricewaterhouseCoopers (PwC), the event saw Masters speaking out about what she portrayed as the risk financial incumbents face by not taking steps to investigate potential applications of blockchain technology in their operations. Addressing the audience, she cautioned that by taking a ‘wait-and-see’ approach to the technology, certain financial providers run the risk of being left behind. Despite this, she stated she believes that startups are unlikely to disrupt many of the larger firms due to their sheer size and market reach, adding that she sees the technology consolidating existing players in the industry. “The advantage of being an incumbent rather than a newcomer is that the economies of scale are gigantic,” she said. Masters also discussed her departure from JPMorgan to blockchain startup Digital Asset Holdings, with the aim of dismissing inaccurate stories about her move. Masters joined Digital Asset, first as a board member in 2014, becoming CEO in March 2015. The company has since raised more than $60m to address industry challenges including regulatory reform and capital requirements, operational risk, systemic risk and cyber risk. But becoming the CEO of a company that was in any way linked to bitcoin was not something she – or anyone – could have foreseen, Masters said. Before Masters spoke, Amal Aly, a director in the financial services advisory at PwC, introduced the concept of blockchain technology to the room. She explained the present-day ecosystem whereby financial information is fragmented and siloed. For Masters, it took reading beyond what was written in the press for her to better understand the opportunities presented by bitcoin’s underlying technology. Fundamentally, what the technology allowed for was a trustless environment, she said. Masters argued that the problem bitcoin was intended to solve was to “create a network where parties who didn’t know each other” could exchange value between and amongst themselves. Once bitcoin was abstracted out of the equation, she explained, what was left was a system whereby parties could exchange value and be completed confident that the item was not counterfeited and hadn’t been faked. “The blockchain was lost in the noise because [bitcoin] was being proposed by people who wanted to see the end of financial institutions and who didn’t want government intervention,” Masters said. The night concluded with Masters drawing attention to how finance is a male-dominated field, and telling her personal story of how she rose through the ranks of JPMorgan and became the leader of a now well-financed blockchain company. She went on to state that, when taking actions male colleagues might have been able to get away with, she was told to not “be so bloody aggressive”. Still, being both a mother and a career woman was something that did present the CEO with challenges. “The reality is, it was a choice I made to have a child and have a career. I think, with hindsight, that I became a better operator in my job for having been a parent than I otherwise would have been. I became a better parent than I otherwise would have been if I didn’t have a career,” she said. 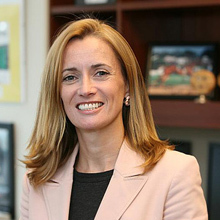 Blythe Masters will be speaking at CoinDesk’s Consensus 2016, 2nd-4th May, in New York.